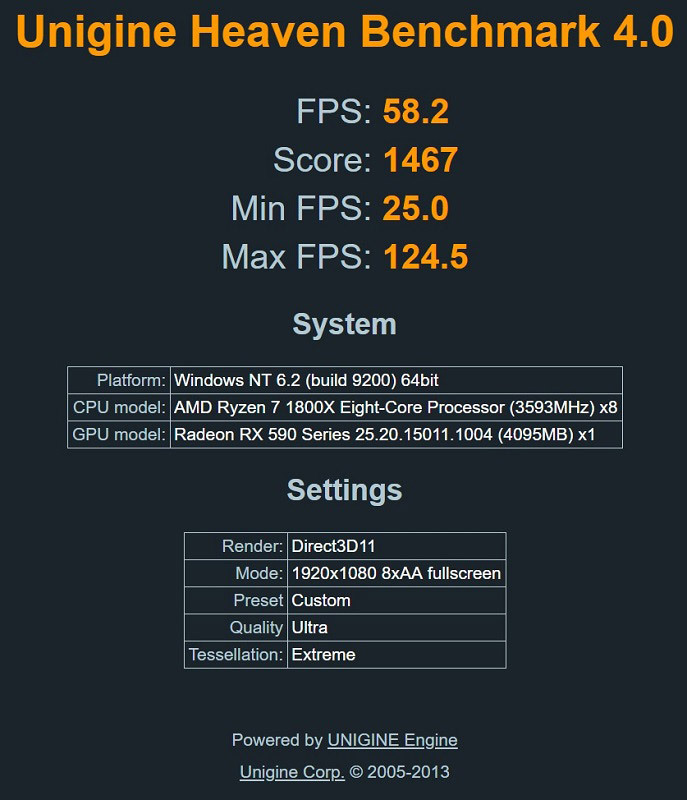 We start directly in the default setting with the Unigine Heaven benchmark and reach 1470 points. In the more modern Super Position Benchmark we reach 2798 points. It continues with the 3DMark Firestrike Extreme. Here the default mode gives us 6751 points. The fourth discipline is the 3DMark Timespy, where we reach 4779 points. After this first run in the default setting we also look in GPU-Z at the maximum temperature, which was measured during the benchmarks: 70°C are a good value for the fact that in Smart mode the RX 590 is audible but not loud. Now we have with the values of the default mode reference values, with which we can compare the other modes. In OC mode we start again with the Unigine Heaven benchmark and reach 1464 points. In the Super Position Benchmark, the OC mode can increase a bit and reaches 2841 points. The 3DMark Firestrike Extreme also benefits from OC mode, reaching 6805 points. Finally, the 3DMark Timespy, where we reach 4953 points. The temperature was also in the OC mode at a maximum of 70°C. In Silent mode we start again with the Unigine Heaven benchmark and reach 1467 points. In the Super Position Benchmark, Silent Mode comes close to the values of the default mode despite a lower clock rate and reaches 2727 points. The 3DMark Firestrike Extreme is more sensitive and reaches only 6473 points. 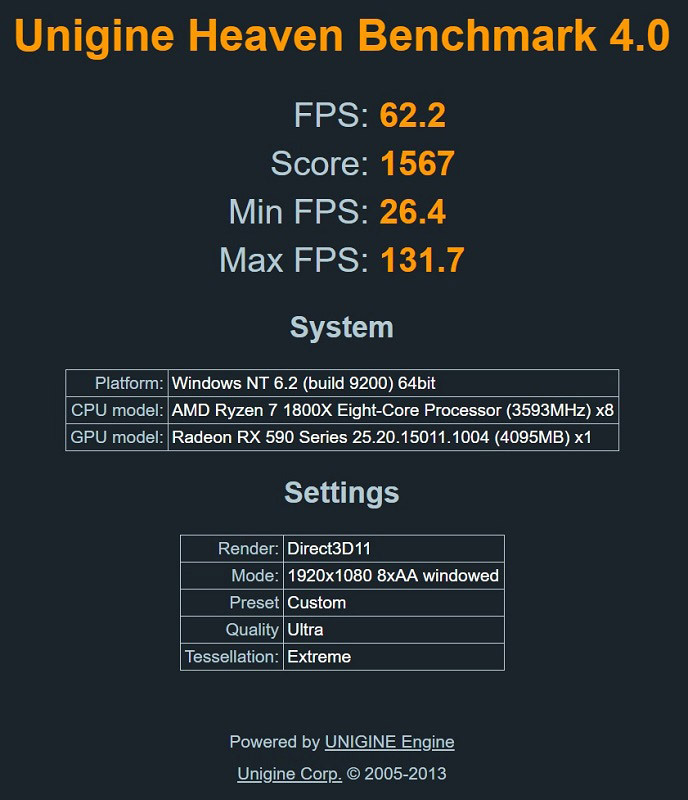 More frugal, however, is the 3DMark Timespy, where we reach a whopping 4800 points. As expected, the temperature was lower in Silent mode at a maximum of 66°C. The cooling worked even a touch quieter. Overall, the assumption that the 3 modes are pretty close together is confirmed. OC versions of graphics cards are always operated by the manufacturer with clock rates that are higher than the standard clock rates that AMD or nVidia provide, but often there is still a little more room for improvement so that the ambitious overclockers can still fine tune. In the first step, we only raised the RAM clock and were able to move the controller a maximum of 2250 MHz to the right, without having to increase the voltage. 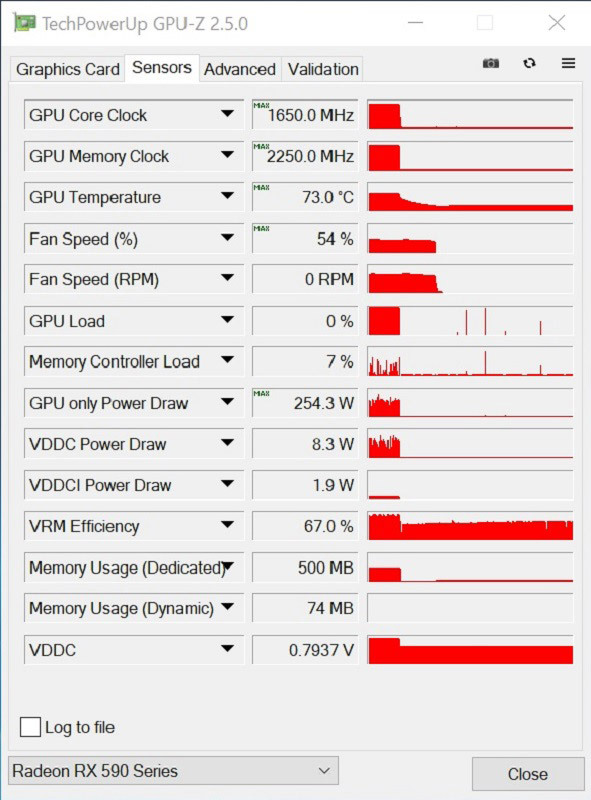 The GPU ran with the ASRock OC clock of 1591 MHz and 20% increased power limit. 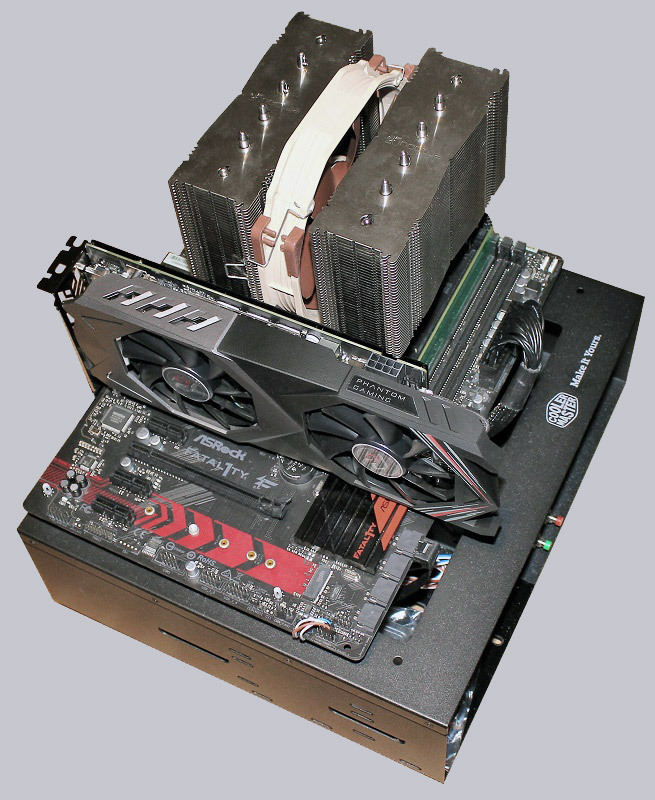 We are curious how the increase in memory bandwidth will affect performance. We start again with the Unigine Heaven benchmark and reach 1529 points. Even in the Super Position Benchmark, the higher RAM clock can grow properly and reaches 2911 points. 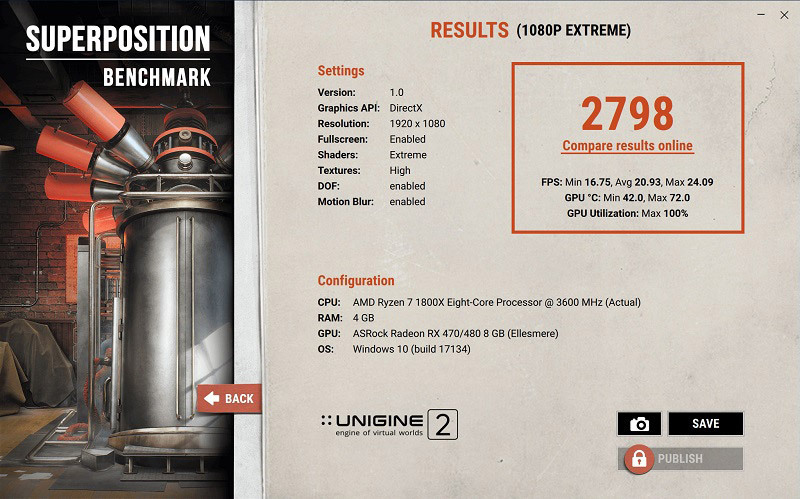 The 3DMark Firestrike Extreme also benefits from the higher RAM clock and reaches 7119 points. 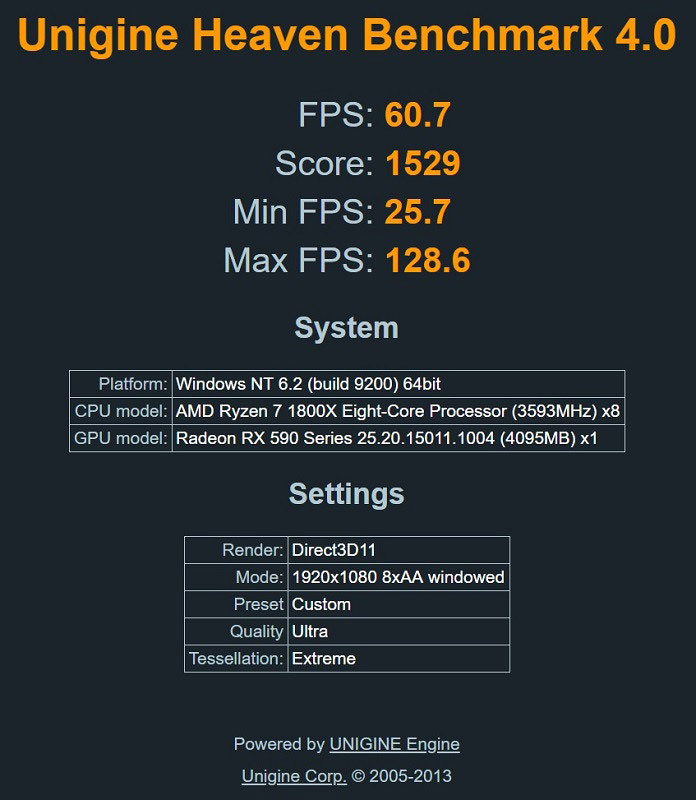 Finally, the 3DMark Timespy, where we reach 5096 points. 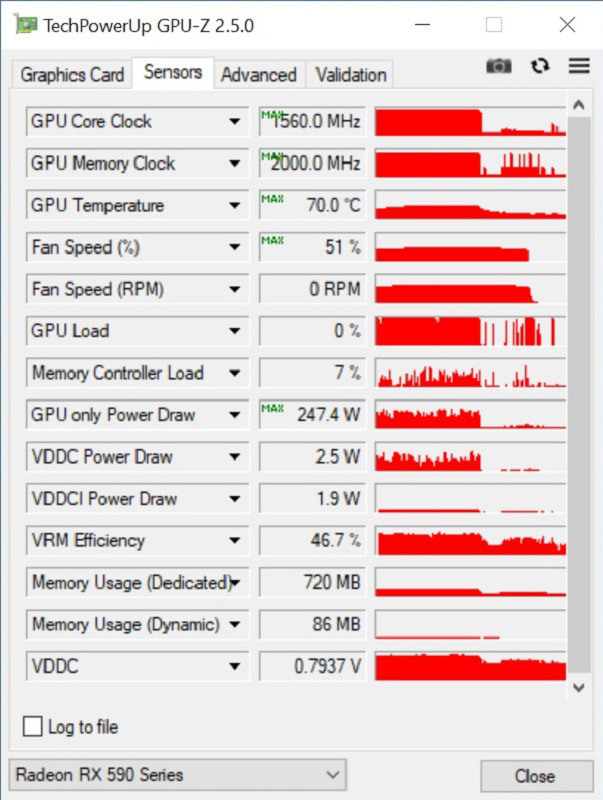 The temperature was expected to be similar to the default and OC mode and reached a maximum of 69°C. 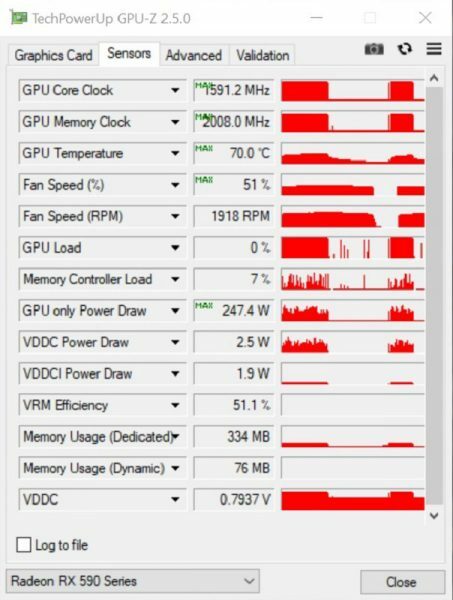 Where the performance gain through higher GPU clock was previously behaving rather behaved, the increase can be seen absolutely by the increased RAM clock. This seems to be the true bottleneck of the RX 590. But now it’s time to pull all the controls to the limit and test where the card’s maximum is :ocinside: We finally reach a stable 1650 MHz GPU or 2250 MHz RAM clock and increase the power limit by 50%. We start directly with the Unigine Heaven Benchmark and achieve a whopping 1567 points. In the Super Position Benchmark it is enough to crack the 3000 mark, we reach 3001 points. It continues with the 3DMark Firestrike Extreme. Again, we put up a gear with 7276 points again. Also the 3DMark Timespy raises the bar once again, we reach 5224 points. 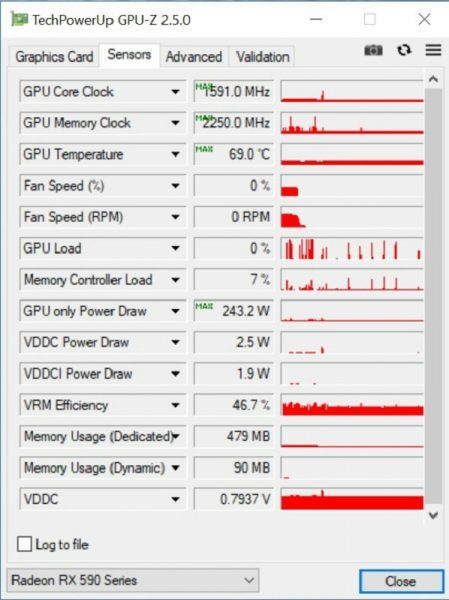 After this last run we look back to GPU-Z, the maximum temperature, which was measured during the benchmark: 73°C the fan mode “Smart” does even at maximum overclocking a really good job. 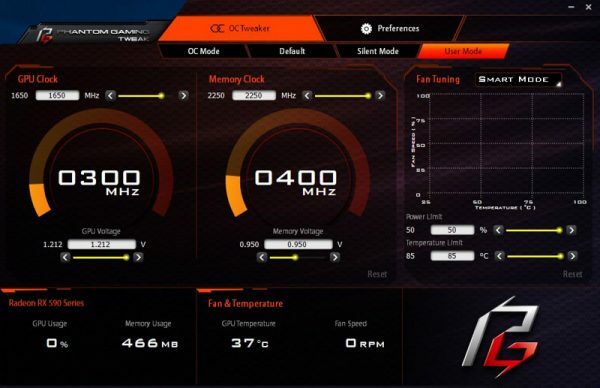 All in all, we were able to get a bit more performance by further overclocking, but the higher RAM clock made the biggest difference, whereas the approximately 60 MHz more GPU clock compared to the OC clock of 1591 MHz with more voltage and higher power limit were bought at a high price. For the 24/7 OC operation we would therefore tend to 1600/2250 MHz GPU/RAM clock, so that no voltage increase should be necessary. Here is a summary of all ASRock Phantom Gaming X AMD Radeon RX 590 test scores in tabular form.